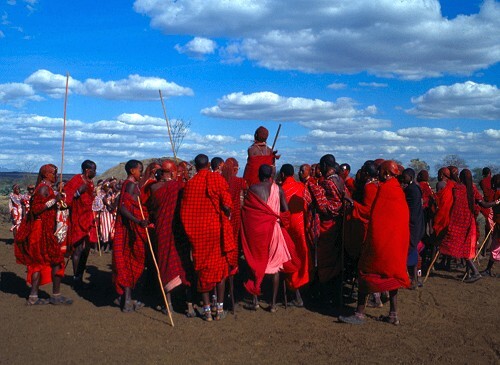 This safari combines two of the most interesting and contrasting Game Parks in Kenya. It provides an even balance between traveling by car and some real out door walking in the African bush. From the Northern frontier (Samburu), which is famous, for it's rare species such as the Reticulated Giraffes, Gravy's Zebra, the long necked Gerenuk and Lance Oryx. 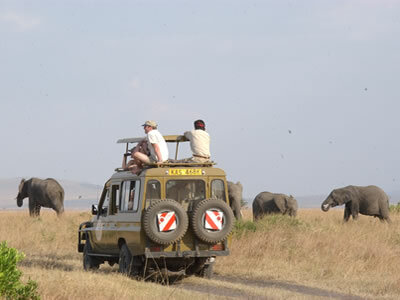 You drive into the Great Rift Valley where you will experience the thrill at a real foot safari. You have the opportunity to hike up the Vulture -inhabited cliffs of Hell's Gate National Park. The last four days are spent walking and game viewing through a wild life kingdom unsurpassed anywhere else in Africa. We mingle with the Nomads and wander among huge herds of plain game - a thrilling experience especially during the period of the wildebeest migration up from the Serengeti between July and October. We return to Nairobi for your final departure or Coastal extension. We also do trekking in northern Kenya and around Lake Turkana, for example Mt Kulal and the Ndotos� plus off course Mounts Kenya and Kilimanjaro. On many of these treks itineraries are varied and flexible. Equipment required by the client is minimal. Good walking boots/shoes. Wicking t-shirt and shorts. Long shirt/trousers, fleece and waterproofs, hat, sunscreen, toothbrush/toothpaste. PLEASE DO NOT BRING ANY SCENTED COSMETICS. We provide sleeping mat and tent, all food and cooking equipment (prepared in Nairobi then frozen for our trips) and of course, our guide. Park entrance fees apply where applicable. Porters are not provided. � Copyright 2005 Mount Kenya Climbing Expeditions. All Rights Reserved.